Mumbai: Vishal Karia (42), a hotelier, businessman and closed friend of cricketers, actors and politicians is in police custody until 17 January — as ordered by the Bhoiwada Court — for allegedly sheltering the three wanted owners of the 1Above pub at his Juhu residence. The Mumbai Police arrested Karia for helping Kripesh Sanghvi, Jigar Sanghvi and Abhijeet Mankar to evade the police in connection with the Kamala Mills fire on 28 December. His name has been added in the FIR under section 304 for culpable homicide, confirmed a senior police official from NM Joshi Marg police station. According to a police official on condition of anonymity, the Sanghvi brothers left Mankar's Audi at Karia's residence on the night of the blaze. The vehicle has been subsequently recovered by the police. The police officials, investigating the Kamala Mill fire incident, further told Firstpost that Karia was suspected to have arranged mobile phones, SIM cards and vehicle for all three accused to flee the city. Karia, a regular face in Mumbai's social circles, is also well-known to a particular senior IPS officer in the Mumbai Police. Among his friends, Karia counts a number of cricketers, especially Harbahajan Singh. According to the senior police official, whenever Harbhajan came to Mumbai, he stayed with Karia. In fact, the hotelier was present at a number of Harbhajan's family functions. But it's not only Harbhajan on his list of cricketer friends: Indian cricket team captain Virat Kohli, Rohit Sharma, Ajinkya Rahane and many others are familiar with Karia. 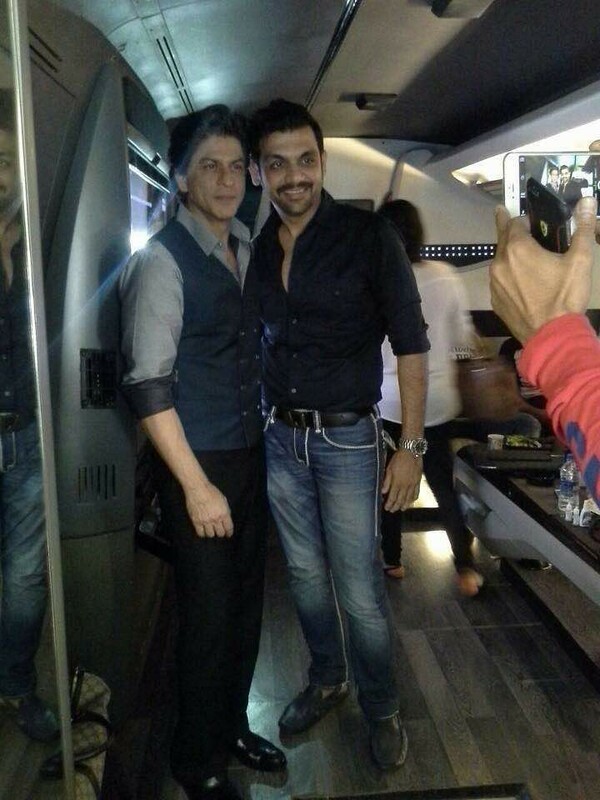 During a number of IPL matches, he has also been spotted in the dressing rooms. After the arrest of Karia, a link between hukka parlours, pubs and match-fixing in cricket is being probed. Karia is a partner in a number of entities including Silver Beach Entertainment, Satra Properties, Balaji Finactics, Satra Reality and Builders Limited, apart from owning many hukka parlours and pub chains in Mumbai. One such hukka bar in Mumbai is co-owned by Karia and Kripesh, police sources confirmed. A case has been filed at the NM Joshi Marg Police station against 1Above and Mojo's Bistro, the pubs located on the rooftop of a building in the Kamala Mills Compound. According to a probe by the fire department, the fire started at Mojo's Bistro and spread to 1Above. Three partners of 1Above have been named in the case and a lookout notice has been put out against their names by the Mumbai Police. Karia was placed under arrest on Tuesday evening after a team from the NM Joshi Marg Police Station picked him for questioning, Deputy Commissioner of Police Akhilesh Mishra told media persons. During the investigation, it came to light that Karia had sheltered the three owners at his residence, he said. The absconding trio has been booked under Sections 304 (culpable homicide not amounting to murder), 337 (causing hurt by act endangering life or personal safety of others) and 338 (causing grievous hurt by act endangering life or personal safety of others) of the IPC. The Mumbai Police filed the case of culpable homicide initially against the management of 1Above but later also added the names of the owners of Mojo's Bistro after a fire department report. A Rs one-lakh reward has been announced for information about the absconding accused. Speaking to Firstpost, Congress MLA Nitesh Rane demanded a CBI inquiry to find out if Vishal Karia had any role to play in helping the accused in the Kamala Mills fire case who are on the run. "Even if police arrested Karia, I demand that a narco analysis test be conducted on him to find out who all he is trying to save. As per my knowledge, Karia has connections with bookies. A CBI inquiry should be initiated in this matter," Rane said. The MLA had written to the ED in this connection in July last year. 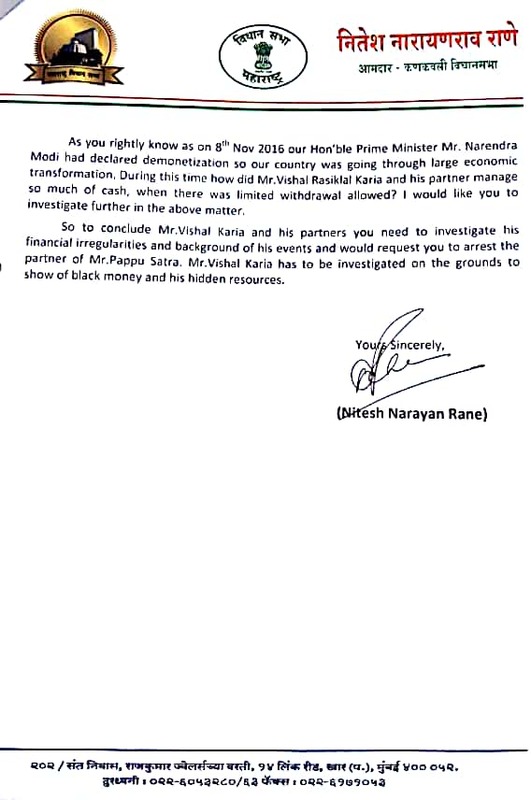 Rane claimed Karia had a history of crimes and that his name figured in the Call Detail Records (CDR) of a cricket bookie arrested recently by the police. "As my sources confirm, a senior IPS official from the Mumbai Police is also touch with Karia," said Rane, "If the car of one of the runaway owners of the pub is found parked at Karia's residence, it must be probed as to what relation he has with the accused and whose invisible hand is backing him." 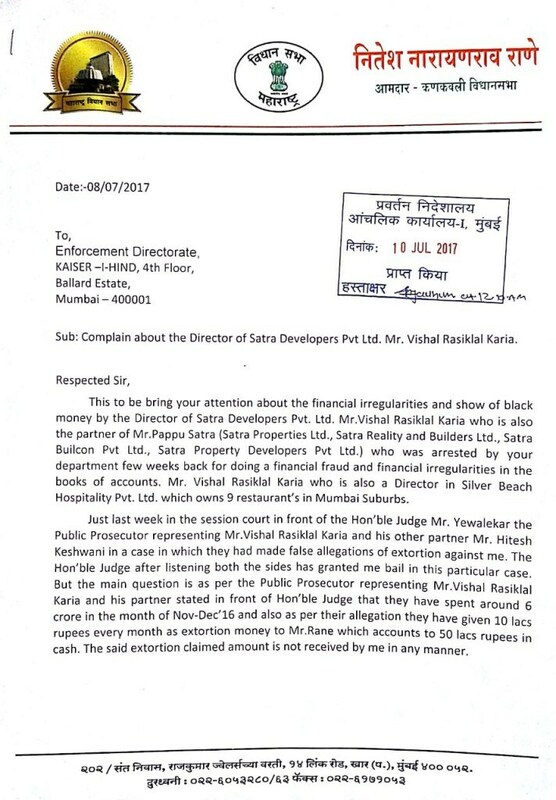 Clarification: An earlier version of this article mentioned that "[Vishal] Karia's business partner Pappu Satra is under arrest, after being nabbed by the Enforcement Directorate in connection with financial irregularities." The ED questioned Satra as part of its investigation and did not arrest him. Firstpost is regretful of the error.